We both like yarn shop a lot. Although we only had 10 min, we still tried our best to touch yarns, feel it, and left sadly. This is the first time I met her. Before that, I already saw lots of her knitting stuff through her blog. I adnired the color she chose for her projects. Because she was going to have an interview, so we did some window shopping around angel before we parted. Summer comes and Wan chan might be oppucied by something else. I still continued my knitting. But I still went to her blog to see if she restarted her knitting again every now and then. It was very exciting when she back to TKA,I couldn't wait to email her to check what she was knitting and when we could meet! We met at London Victoria and we both wore what we just knitted. 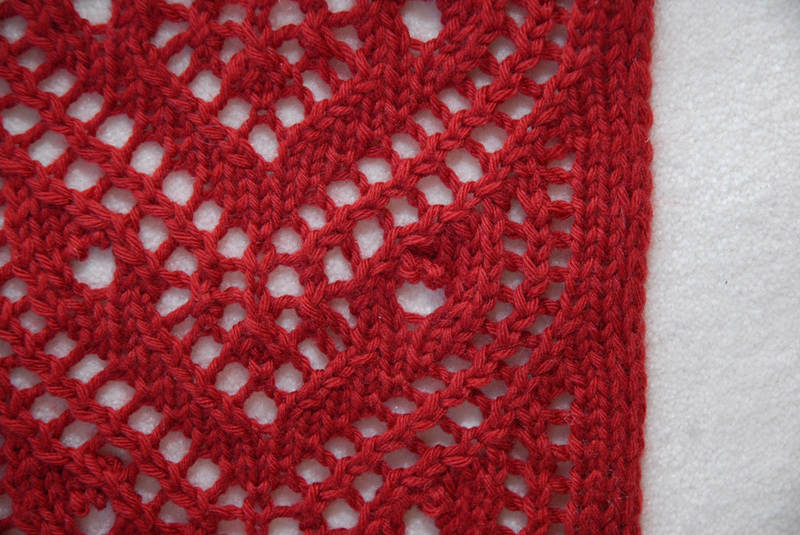 I also gave her the pattern I just knitted.She showed me how to do the fishermnan's rib she just learned. I did enjoy the day a lot. and I felt so lucky to know her in this city. I don't have too many friends, especially someone with the same hobby as me. Most of my colleagues were surprised when they know I knit. Except that, nothing much. It is totally different experience when I chat knitting with Wanchen or Regina or Celia, it feels like they do care about what you wanna say except just trying to listen. Besides knitting she talked a lot about cycling. She also mentioned she and her husband cycled to Briton from London for 5 hours. He prepared a tomtom for the bikes but it directed them to the motor way which freaked her out! And how terrified when she tried to cycle from Hackey to south kensignton.She tried several times and failed. but she still loved to try it. I thought she was such a brave girl because I live in zone 5. the traffic is much much better than central london. But I had a horrible experience when I cycled just around where I live. I stocked in the middle of a round-about and I decided never ever do that again. That was the most wonderful meetup I had for that last 6 months. I was so looking forward to the day we meet again. I gave her some knitting information through email and thanked her to have given me such a wonderful time.She didn't manage to reply my mail after 2 weeks. She apologised for being so late to reply my mail. and say we defnetely will meet again soon. She also mentioned she finally successfully cycled from her place to south kensignton. She was happy about that and she was gonna try to do it everyday. I was very surprised she did it. I was waiting for her mail until today. and was thinking i might call her to book time to meet. Hi my name is William McGuinness. I am Wan Chen's husband. I am sorry that you had to find out this way. I have been trying desperately to contact everyone that knew her. Please contact me either at Wan-Chen's home number if you have it or e-mail me at wildbill@doctors.org.uk. If you would like to attend my darling wife's funeral you would of course be welcome. She had mentioned that she was looking forward to knitting some more and meeting up with you again. Hello,我和上面的Fionna,and Wan-Chen,是以前在美國唸MFA時的同學.唸書時,每天下課後,我們3個人總是一起去Starbucks混,聊上課,聊編舞,聊同學...雖然3個人現在各在不同的國家,但上星期我們3個還一起在MSN聊了一大串而已...昨天早上醒來,就接到Fionna從美國打電話來告訴我這件事,到現在都還不敢相信我的好朋友Wan-Chen,就這樣走了...感覺真的很無力...I can't help my sorrrow! she'll be an angel or whatever she wanna to be.